Roxy Music is the debut album by art-rock band Roxy Music, released in June 1972. All songs written by Bryan Ferry. The opening track is Re-Make/Re-Model, which starts with a musique concrète introduction, a short collage of cocktail party noise, before launching into a stereotypical 1950s song structure. Whilst the basic backing track of guitar, acoustic piano, bass guitar, tenor saxophone and drums is relatively straightforward and traditional in form, other elements of the arrangement are quite bizarre and futuristic: Eno plays continual squalls of atonal oscillator noise from his Electronic Music Studios VCS3 synthesizer, whilst Ferry’s lead vocal style is strikingly distraught and anguished in tone, as befits the lyric: I tried but I could not find a way/ Looking back all I did was look away. The lead guitar and saxophone solos in the middle of the song also tend towards cacophony. At the end of the song, each instrument is allowed a short solo break in turn; the guitar mimics Duane Eddie’s C’mon Everybody; the bass guitar solo mimics the riff from the Beatles song Day Tripper. The lyrics describe a man who is afraid to approach a woman he’s attracted to. Ferry explained in an interview that Eno and MacKay’s backing vocal chorus of CPL 593H was the number plate of the car in which the woman is riding. Ferry took inspiration from a personal experience – the number plate CPL 593H belonged to a car he previously owned. After he’d sold it, Ferry saw it parked in a street, and observed an attractive young woman get into the car and drive away. To immortalize the moment, he wrote the song. If There Is Something is the third song on the album. The song begins in a rather light-hearted, jaunty fashion, a slight pastiche of country music, with honky-tonk style piano and twangy guitar. Ferry’s singing is nonchalant and jocular. However the mood of the song builds with a repeated instrumental motif hauntingly played between guitar and saxophone, and then Ferry’s vocals re-enter to provide a fraught vocal climax, the lyrics including a reference to a passion for secrets, roses, and (bizarrely), growing potatoes. The instrumental motifs then return, finally giving way to an emotional end section where Ferry’s impassioned, nostalgia-infused and melancholy vocals are set on top of a lush blend of backing vocals and the mellotron ‘three violins’ tape set. The song is tripartite in structure and it has been suggested that the first part of the song is a youth wondering about love, the second part is an adult in the heat of passion and the third part is the singer in old age thinking about his past love. The song features prominently in the 2008 film, Flashbacks of a Fool, written and directed by Baillie Walsh, and starring Daniel Craig. In a memorable scene, a young Joe Scott and Ruth Davies dance in Ruth’s living room and mime to the song; Joe dressed as Bryan Ferry. 2HB is the first of the songs that are thematically linked to films/movies. The title of 2HB is a pun – the song is not in fact about pencil lead, but is actually Ferry’s tribute to Hollywood film star Humphrey Bogart. (2HB = To Humphrey Bogart.) 2HB quotes the line ‘Here’s looking at you, kid’ – a famous line from the Bogart classic, Casablanca (1942). The song is gentle and mellow in tone, evoking a smoky cabaret atmosphere and classic black-and-white films. The song is dominated by Ferry’s Hohner electric piano, and features a sax solo in the middle where MacKay’s playing is treated with tape echo effects by Brian Eno. The Bob (Medley) is the next track. The song was inspired by the war film/movie, The Battle of Britain (1969), the song’s title (BoB) being an acronym for Battle of Britain. The sound of gunfire and explosions from the battlefields can be heard throughout the instrumental refrain. Would You Believe? is an elegant, delicate and anguished lament to an inscrutable, elusive someone. Would you believe in what I do/ When the things that I make are all for you?… Ferry sings forlornly, before adding cynically: Well I’m sure I’ll love you all my life/ And in the morning too…. Bitters End is the final song on the album. The song is based on a group vocal arrangement done in a satirical 1950s doo-wop style. In the middle eight, the band sings ‘bizarre’, which seems to sum up the initial impact of the first listen to the album. Discussing the album’s music, Andy Mackay later said: ‘We certainly didn’t invent eclecticism but we did say and prove that rock ‘n’ roll could accommodate – well, anything really’. The band’s penchant for glamour was showcased both in the lyrics and in the 1950s-style album cover, with photography, hair dressing and art work credits detailed on the sleeve. The photographer, Karl Stoecker, shot the cover featuring model Kari-Ann Muller, who later married Chris Jagger, brother of Mick Jagger. The album’s original cover, as issued in 1972, featured a gatefold sleeve picturing the band in stage attire designed by Antony Price. The entire album was recorded in a single week. This was necessary because the group had no record deal and their managers at EG were financing the sessions themselves. The album was produced by King Crimson’s lyricist, Peter Sinfield. In May 1972, a few weeks after the recording sessions, a contract was signed with Island Records and in June, Roxy Music was released. 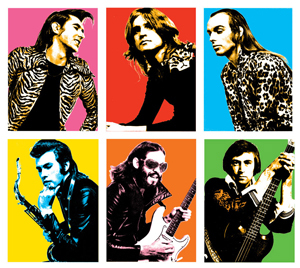 Roxy Music was generally well-received by contemporary critics and reached #10 in the UK charts. It is now considered by many to be Roxy Music’s best album.